The real life story of Jeff Bauman, an ordinary man who captured the hearts of his city and the world to become a symbol of hope after surviving the 2013 Boston Marathon bombing. 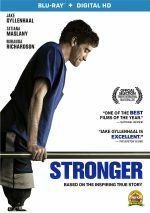 While 2017’s Patriots Day offered a broad take on the 2013 Boston Marathon bombing, Stronger takes a smaller, more personal approach. Bostonian Jeff Bauman (Jake Gyllenhaal) works at a supermarket deli counter and lives with his alcoholic mother Patty (Miranda Richardson). One day Jeff re-encounters his ex-girlfriend Erin Hurley (Tatiana Maslany) and learns she plans to run in the Boston Marathon. Eager to prove himself to her, he raises money for her run and promises to meet her at the finish line. Jeff lives up to this commitment and finds himself at ground zero of the catastrophe when an explosive device detonates. This causes the loss of both legs and leads Jeff on a struggle to deal with his new reality. Gyllenhaal earned an Oscar nomination for 2005’s Brokeback Mountain but otherwise has received no love from the Academy. That seems like a shame, as Gyllenhaal regularly turns in good performances – the fact Oscar slighted him for 2014’s Nightcrawler remains a travesty. Because the movie flew under the radar and didn’t attract much theatrical attention, I doubt the Academy will recognize Gyllenhaal for Stronger. That’s too bad, for he offers another solid performance as our protagonist. Given the nature of the “inspirational hero” genre, Jeff provides an unusually complex lead. Normally the character would come across as a genial, “never say quit” sort without real flaws, but Stronger doesn’t fall into that trap. Instead, the movie makes Jeff a surprisingly broad and three-dimensional personality. Stronger doesn’t shy away from the problems – both mental and physical – he faces after he loses his legs. Indeed, the scenes in which Jeff deals with PTSD and all the pressures of his newfound – and unwanted – fame become the film’s most impressive. Gyllenhaal adds depth to the sequences and gives us a firm sense of a man who struggles to cope with his new reality. Director David Gordon Green ensures the movie doesn’t indulge in too much schmaltz. Sure, we know there’ll be a happy ending and we know that we’ll find inspirational moments, but Green leavens these with both a sense of darkness unusual in the genre as well as organic instances of humor. The latter bits become more remarkable given the prevalence of the former. Stronger doesn’t shy away from the pain Jeff experiences, so the comedic moments could come across as forced or awkward. Instead, they blend naturally and add gentle – but necessary – glimpses of levity. I maintain a severe allergy to gooey “inspirational tales”, so I feared Stronger would offer nothing more than sentimental tripe. Instead, it provides a vivid, emotional journey that satisfies on all levels. Stronger appears in an aspect ratio of approximately 2.40:1 on this Blu-ray Disc. Overall, this was a positive image. In terms of palette, Stronger went with mix of teal and amber. Overall, the hues were fine for their visual choices. As for the film’s DTS-HD MA 5.1 soundtrack, it gave us competent sonics most of the time as well as a little pep on occasion. A drama like this didn’t need to boast a rock-em, sock-em mix, so the audio seemed acceptable. Usually, the soundfield didn’t have a lot to do; it concentrated on good stereo music and general ambience. Every once in a while, though, the mix came to life – in a moderate manner, at least. This was especially true during the marathon scenes or at a hockey game. These didn’t dazzle, but they gave the mix reasonable breadth. Faith, Hope and Love: Becoming Stronger runs 29 minutes, 25 seconds and provides notes from director David Gordon Green, authors Jeff Bauman and Bret Witter, executive producers Nicholas Stern and Riva Marker, hair/makeup designer Donald Mowat, costume designer Leah Katznelson, United Prosthetics’ Paul Martino and Greig Martino, cinematographer Sean Bobbitt, production designer Stephen Carter, and actors Jake Gyllenhaal, Miranda Richardson, Clancy Brown, Patricia O’Neil, Danny McCarthy, Nathan Richman, Richard Lane Jr. and Lenny Clarke. The show looks at the book and its adaptation to the screen, story/characters, cast and performances, effects and costumes, locations, production design and photography. “Faith” delivers a fairly solid overview of the film’s creation. 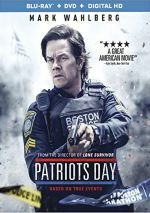 The disc opens with ads for Wonder, American Assassin, Patriots Day, The Glass Castle and Deepwater Horizon. No trailer for Stronger appears here. To my relief, Stronger avoids most of the traps that befall the majority of “inspirational stories”. It feels honest and impactful as it tells an emotional tale. The Blu-ray presents very good picture along with adequate audio and one featurette. This impressive drama deserves more attention than it received theatrically.